Inspired by the plants and insects in their garden, jewelers Roberta and David Williamson will be among 145 artists from across the country showing their handcrafted work this week at the American Craft Exposition (ACE). The juried exposition at the Chicago Botanic Garden is also a fundraiser for the Auxiliary of NorthShore University HealthSystem. Roberta recalls the early days of her work, when, shortly after her daughter was born, she peered out the window and observed a mother bird feeding its young. She marveled at its instinctual behavior and how the scene symbolized her own experience. The artist was inspired to create a series of charms for necklaces depicting stories of nature such as that one, which she later told to her young child. “I always see those kinds of connections between people and nature and how inspiring that is,” she said. As much as nature enhances their work, the jewelers also find inspiration in other sources. “I think besides the garden and any insects and birds, the other part that we are really interested in is antique etchings, but primarily the early costumes of royalty and the embellishment on the clothing that they wear,” said Roberta. Both interests can be seen in much of the body of work they create each year. Just as their own stories have evolved over the years, such as Roberta finding a love of nature after moving from Chicago to the suburbs as a child, the story of each piece of their jewelry evolves from the time they begin to create it to the life it takes on when it is in the hands of a new owner. ACE cannot come soon enough for the couple, who are energized by the atmosphere of the event, the presence of their fellow artists, the event committee, and the lush setting of the Garden. “I just hope that a lot of people will be able to come to see how spectacular the combination of the art in the show is beside the Botanic Garden. I think their spirits will be so lifted that it will be really magical,” Roberta said. The American Craft Exposition opens with a Benefit Preview on Thursday, September 14, and is open to the public Friday through Sunday, September 15 to 17. Proceeds from ticket sales support research into orthopaedic regenerative medicine and pharmacogenomics, or how changes in one’s DNA affect the way the body responds to medication. It always starts with the place. 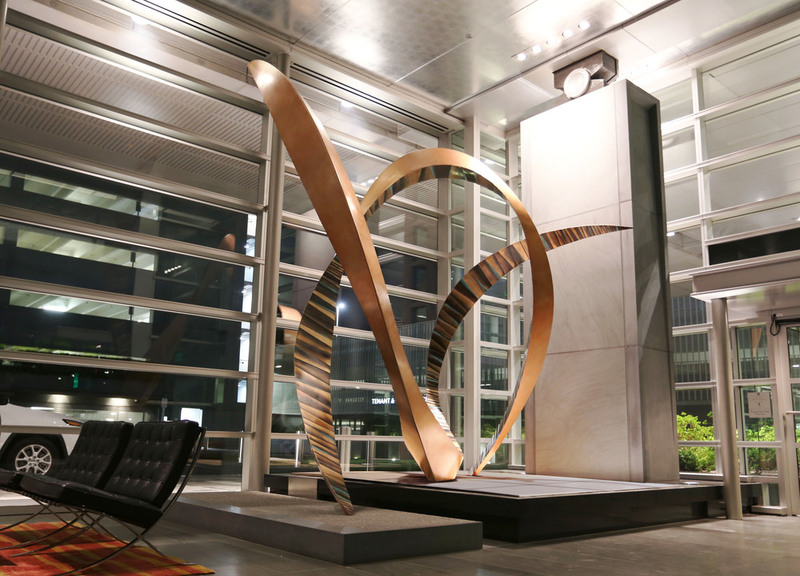 The garden, the park, the stairwell, the commuter train station—wherever the artwork will be sited, Michael Szabo starts out by spending time in it. 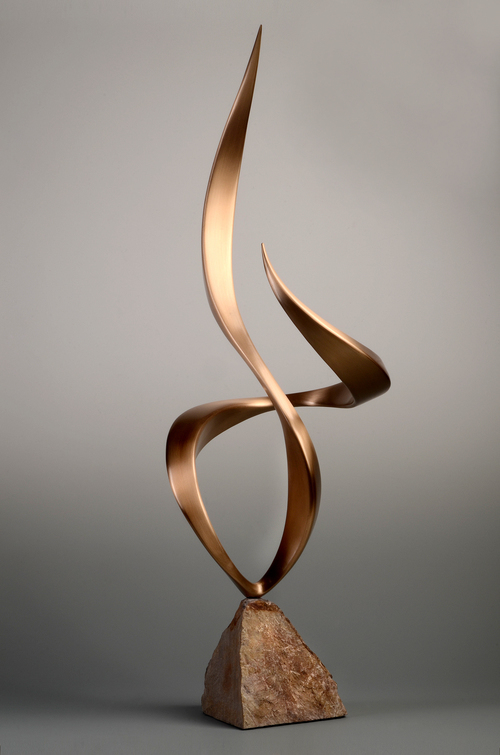 Szabo, a maker of sculpture, waterworks, and tabletop vessels, is one of the artists who will be featured in the American Craft Exposition (ACE), held at the Chicago Botanic Garden this weekend, September 23 through 25. Buy your ACE three-day pass today to see the show all weekend long. At this juried exposition and sale of fine crafts, visitors can see and buy one-of-a-kind works in metal, ceramics, fiber, jewelry, glass, leather, and other media. The show, which features some of the top crafts artists in the country, will help support pharmacogenomics at NorthShore University HealthSystem. Attending the show is a chance not just to see and buy art, but to talk to the artists about their creative process. Szabo’s begins with the site. “I’ll come and look at a space, and it’s the space that really inspires the concept and the work, as well as the goals of the project,” he said from his studio in San Francisco. Michael Szabo begins work on a piece in his San Francisco studio. He considers the landscape, the architecture, the feeling. He thinks about the spot’s history, its place in people’s daily lives, its meaning to a community. Then he puts his hands to work. He builds a small model, experimenting with various materials and exploring how they move and behave. Ideas begin to take shape. Take water. Szabo has learned by experience that you can’t force water to do anything. As he builds the model, the exploration and creativity flow. For larger, sited works, Michael Szabo visits the site to make sure the piece will integrate into its surroundings when complete. 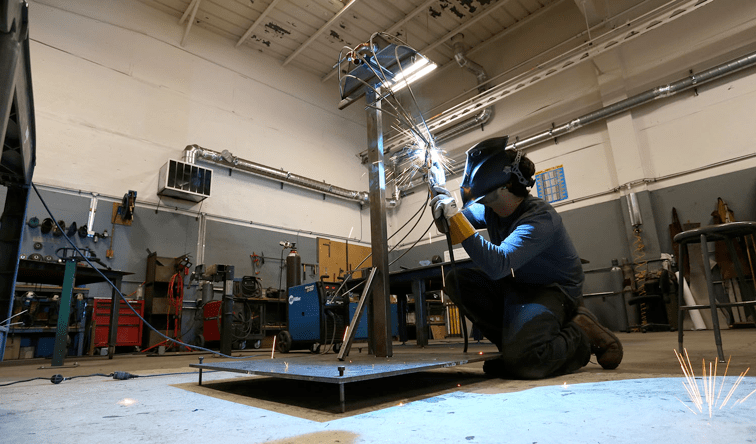 “It’s almost like I’m using this solitary, really exploratory process of building a small structure by myself and seeing what the material wants to do, creating these curves based on the material, gravity, stress, and pressure,” he said. Then Szabo and his assistants turn his model into a full-size artwork. They fabricate support structures and shining curves of steel, assemble them in the studio and make the model into large-scale art—a wall of rugged metal panels covered by sheets of falling water, a sculpture formed of intertwining tendrils of steel, another that arcs and curves like a huge, silvery snake. 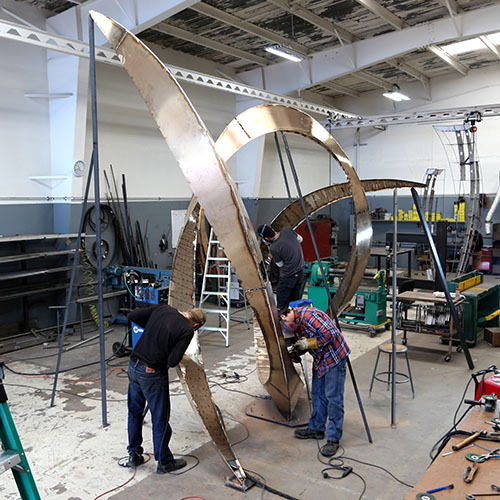 Studio staff assist in welding a larger piece. But his work isn’t all large-scale; he has never stopped making the small, sleek, steel vessels that marked his first explorations into making art with metal. He’ll be bringing some of his elegant tabletop sculptures to ACE, along with larger pieces and water features. And while visitors to the show will get to talk with outstanding artists about their work, the artists will also be able to talk to the public. It’s an interaction Szabo appreciates. He is deeply involved in his current project, a commission from the town of Wylie, Texas, to create sculptures marking the start and finish of a walking path. He plans to evoke both the site’s past as a Texas blackland prairie and its future as part of the bustling Dallas metroplex. He’ll be glad to talk to you about it.